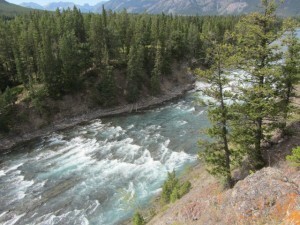 Canada’s National Parks – awesome! 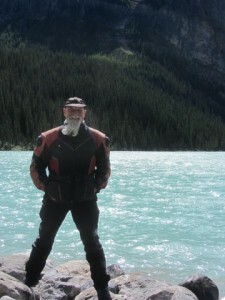 After a couple of days chilling out on the ferry after our time in Alaska we hit the road and headed straight for Canada’s national parks – Jasper, Banff and Kootenay. Camping in these national parks adds to the experience. Big sites in the woods mean you are on touch with nature. 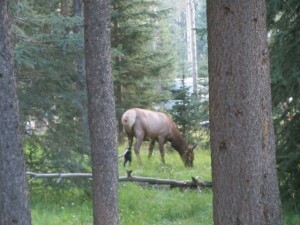 An elk meandered past our tent on the first night in In Jasper. We spent a day riding around the park past Medicine Lake – so called because the first nation people thought this lake was bad medicine when it disappeared every winter. It’s actually due to the fact that the rains and melting snow don’t top up the water and it fills the underground cervices. 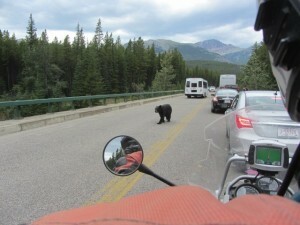 The clouds mean we don’t see Lake Maligne at its best but the ride up there is wonderful – and the ride back offers us an up-close and personal meeting with a black bear. 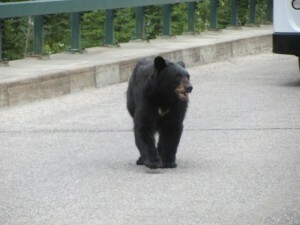 He’d been quietly eating berries on the side of the road and then decided he’d like to try the berries on the other side of the bridge. He wandered up the street and took a long, hard look at us on the motorcycle and then continued on his merry way. He was SO cute – but you wouldn’t want to rile him! 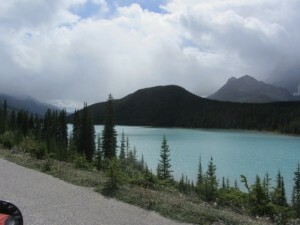 Further south is Banff – a mountainous national park and to get there we ride down the very impressive Icefields Parkway. 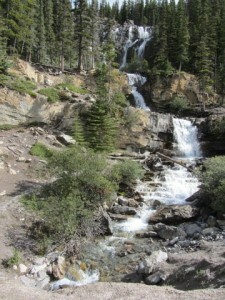 It’s said to be one of the most picturesque rides in the US and it is. Wets on we head down the Icefields Parkway. 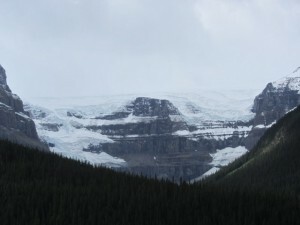 It is the most amazing drive – we pass mountains capped with snow and glaciers. They might not be as impressive as the glaciers in Antarctica but they are still a sight to behold. 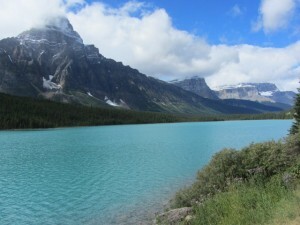 South of Jasper is the beautiful Lake Louise. This glacier lake is the playground for the rich and famous and you can see why. It’s incredible to think that this lake freezes during winter. Must remember not to complain about Melbourne’s winters anymore! 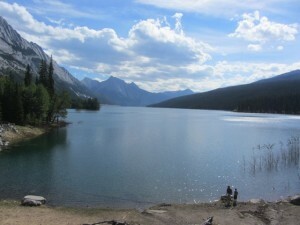 From Banff we headed back in to British Columbia for Kootenay National Park. People come here for the thermal pools – we came to get away from the long weekend crowds. 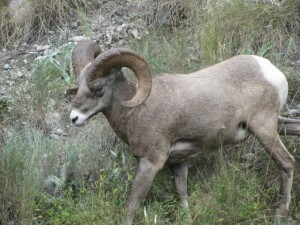 And we were successful – our main encounter was with this sheep. Now it’s back to the States. Like the photos and trip updates . Again great to see your photos from Jasper I am quite certain I know the park you camped in – bear scratch marks on the trees ! 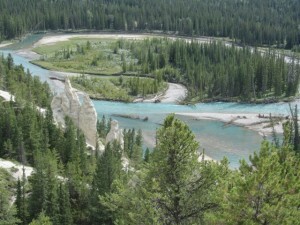 I remember the elk and caribou in and around Banff and the magnificent drive down the Icefields Hwy b/w the two towns. 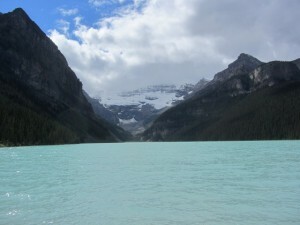 Lake Louise and the rest were also stunning. Will continue to keep track of you both.